I’ve been thinking a lot about traction lately, partly because it is kinda scarce around my house with ice covering my driveway and walkways, making every step a leap of faith. The other reason I’ve been thinking about traction is because I’m putting the final touches on a presentation on Traction Management at the new Thompson Speedway next week. Writing the presentation outline made me think how much traction management is a part of almost every moment of our lives. Walking, driving, and even showering all require a certain level of traction management. We don’t always think of these mundane things as tasks that require “traction”. But, our brains are constantly calculating whether our footing is secure enough to prevent us from slipping in the shower, or sliding down stairs, or careening off the road. Having enough available traction is critical for safely riding a motorcycle. But, are you as sensitive about your tire’s traction level as you are the traction level of your footing when you step into a shower? Most people would have to answer “no”. That’s partly because when you are riding a motorcycle, the interface between your nerves and the ground is insulated by tires, suspension, a frame and a seat. When you’re standing in the shower the nerves in your feet are almost directly connected to the tub so that it is easy to tell whether the surface has enough grip to not slip. If you’re not sure, you simply move your foot along the surface to determine whether you must take extra care. Once you’re out of the shower and dressed, your shoes separate the bottom of your feet from direct contact with the floor, which adds a level of complexity when determining traction. In this case, we rely more on the whole nervous system to tell whether our shoes have enough grip or not. Your proprioceptive senses are the senses that communicate with your brain and muscles to keep you safe. Proprioceptors tell you about the relative position of body parts and strength of effort being used as you move. They are located in your muscles and joints and help you perceive your body in space. A slight slip will trigger your proprioceptive senses to tell your brain and muscles to react to regain balance. Riding stiff in low traction situations is a bad idea. On a motorcycle, you must develop the ability to sense whether your tires have enough grip on the road for you to remain upright. But, how is this possible? First, you must learn to “read” the information being delivered by your motorcycle’s tires and chassis. Your bike’s components are speaking to you through the language of slip angles and aspects of balance that include roll, pitch, and yaw. As your bike leans, dives and squats, your nerves are calculating whether your bike is in balance and on the intended path or at the beginning of a loss of control. A relaxed posture allows clear communication between you and your tires. You feel this through the footpegs, handgrips, and seat. Keeping firm, but relaxed contact with the grips and pegs and riding with a relaxed posture will allow the best transference of information between your tires, the suspension and your nervous system. Everyone who rides has a traction sense, otherwise we would never be able to trust that we would make it out of our driveway, let alone negotiate corners at speed. 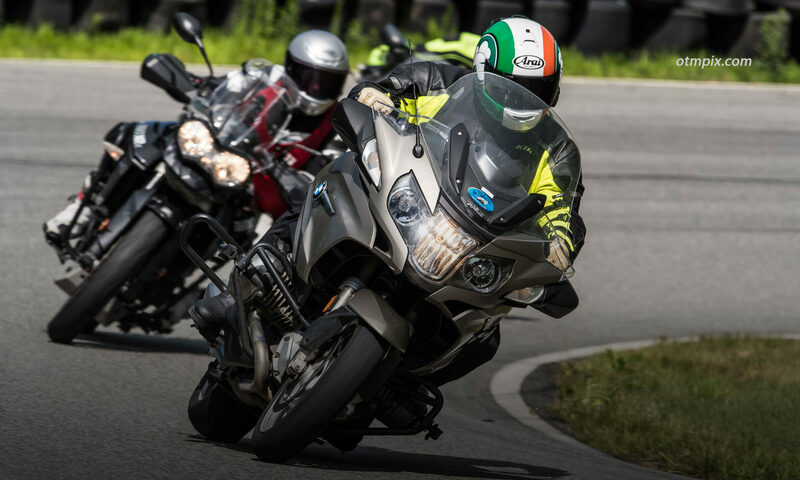 A rider who is able to manage less-than-ideal traction situations is highly proficient at sensing what the tires are doing. The information is there, you just have to listen. Share your thoughts on developing a traction sense. I received a question via Facebook that I thought I’d share so others may benefit. Dave, I’ve also experienced my share of slips and slides, some thrilling and fun, others not so much. I believe that a superior traction sense begins with knowledge about traction and then awareness of all the subtle things that go unheard by most riders…vagueness in the handlebars, seat or pegs tells you that you’re getting close to sliding past the point of no return (or “I meant to do that” if you’re lucky). When your senses feel you falling over is when it becomes much harder (impossible?) to recover control. Are you coming to the seminar on Saturday? The presentation is on traction management. The “vagueness” in the handlebars is a sure fire signal that traction is not at 100%. Understanding how our inputs can cause traction to go from adequate to insufficient is how we avoid getting to that place to begin with. Good body position that allows the bike and suspension to move freely is one important facet. Thanks for the article. I’m developing my traction sense by comparing and noting what I feel to what has changed – tires, suspension settings, pavement type, etc. As a new rider, just about all of the input from my suspension was “vague” because I had no baseline reference for what I was feeling. For example, when I bought my first bike with race take-off tires, the rear would always slide in the same curve on my commute but when I bought new tires the rear slide was gone. The (mild) sliding was something I had learned to live with that turned out to be a sign that the rear take-off had exhausted its grip despite the available tread left. And 6 years later I’m continuously building on that sense based on riding conditions, tire selection, suspension settings/changes, throttle/braking/steering inputs – and how all of these things affect each other. Actually, Mark, your rear wheel slide with race take-offs was likely due to the tires not reaching operating temperature on the street. Race tires are not suited for street riding because it’s impossible to get them up to proper operating temperature on the street (and if you do, you’re riding WAY too fast). Street tires grip much better at street speeds. Save the race tires for the track and even then make sure you go easy for a lap or two to get them up to temperature. Previous PostPrevious Is it Spring Yet? Get Ready!